Together the two fight to defeat an enemy far more advanced, and far more cunning than Arcadia has ever known. But extinction lurks around every corner, and The Enemy isn’t the only one threatening to destroy the world. Arcadia is a junkyard planet but it collects more than just broken ships. Before it was a recognized planet, it had been a place of refuge for lost voyagers. Eventually it began to collect people like it collected trashed technology. Some were refugees, others were stranded after running out of money for their journey, and some were simply shunned from their own worlds. With so many different people there’s a lot of borrowed pieces of culture that has been meshed together to form the Arcadian way of life. For example: they love to refurbish or repurpose technology but it is the highest crime of their court systems to help create or aide in the creation of cyborgs: part human, part technology. Don’t improve what man did not make. The law developed from their belief that a soul cannot find the World Beyond unless the body is whole. It makes navigating the Field of Stars, a type of purgatory, difficult because a partial soul would have to wait for a whole soul to help guide them. This belief was stolen from the Monks on the planet Maldeen who had a very different lifestyle, rarely traveling into space. Paelae is the outsider on Arcadia, she comes from a more crisp and clean way of traveling space. It’s like taking Captain Picard and putting him on the Serenity. 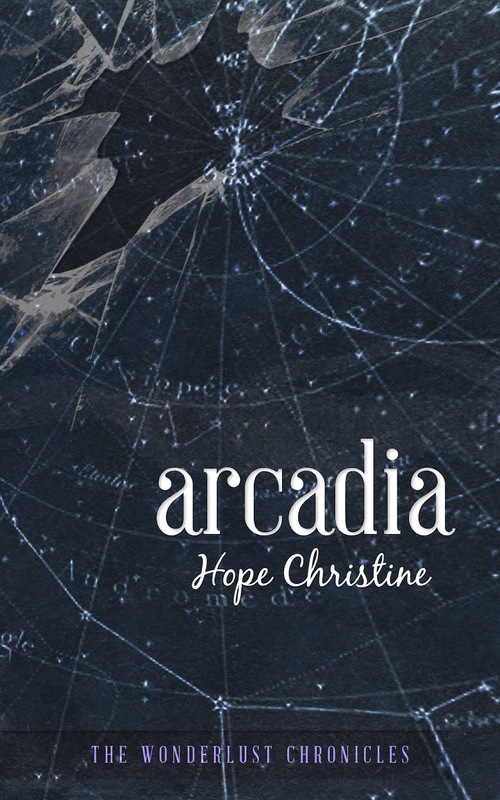 She has a hard time adjusting to their way of life but as you read it from her perspective you begin to pick up on where all those bits and pieces of Arcadian society came from. Lemise, who is born on Arcadia and has had little contact with other races (since most just fire at them for scavenging the graves of the dead) sees Paelae’s past life on the Imladian ships as very excessive and wasteful. In this way, as well as others, they tend to clash. As the story progresses you can really see how Paelae’s and Lemise’s culture begin to shape who they become from a young age. Officers stumbled over each other in preparation for the day ahead. As soon as the first rays of purple sunshine peaked over the city, a line had started to form for the bathrooms, and Paelae was thrust back into the world of the living with a jolt. Sweat covered her face, and her breathing was too rapid. Despite the cramped space, the other women gave her a reasonable berth, some eying her while checking their weapons. Had she screamed in her sleep? The nights had grown increasingly rare when she didn’t have a nightmare. “Hey.” Paelae sat up and tugged the clothes out of her trunk. She ran a hand over the purple and black jumpsuit provided for her; it felt wrong, wearing the colors of another people. It was the first time anyone offered her a uniform. She preferred the Imladian one; it was familiar. “Hey.” This time she looked up, noticing that the one-word sentence had been directed to her. Of course, the woman from the ship. Benni was a head shorter than Paelae and bore the markings of a low rank. “I’m Paelae,” she said and stood to greet Benni with a hard stare. “I’m your…” She searched for an appropriate word. Paelae took the cue and began her attempt to navigate out of the barracks, jumping over beds and weaving around people until she reached the metal door. Outside, the world was tainted purple as the sun filtered through Arcadia’s atmospheric shielding, a product of too many chemical bombs. What had once been a rushed patch job to keep air on the planet had since evolved into a last line of defense worthy of acknowledgment. It was one of few things Arcadians boasted about among the planets—when the planets still existed. Captain Lemise stood just outside the barrack doors, looking across the miles of asphalt designated for intergalactic travel. Bordering the west side of the airfield and encroaching fast upon the north, were piles of rejected technology and broken spaceships tossed out by hundreds of different races. That’s how Arcadia had started, as a junkyard, but then lost voyagers found a home on it, attracting others—from those shunned by their own people to travelers broken down with no funds to continue on their journey. Eventually, it became a home for those who had nowhere else to go, and scavenging became more than an act of survival; it became a trade. Most of the north and east were surrounded by low-class, brick apartment buildings, meant for the soldiers and their families. She almost laughed. Particle shields were difficult with the right materials, but with makeshift metals and roundabout wiring, he would be lucky if it turned on in three weeks. “In exchange, you will work beside me in the evenings,” he continued. Lemise didn’t expand any further on her evening expectations, but Paelae suspected they would be dull at best until Lemise began to trust her better. “Yes, sir,” she said. Centuries of military training had drilled the habit into her. He led them to a jeep, and another soldier drove them east to a warehouse that stood ten stories tall. Behind it, a mesh, wire gate separated civilian from soldiers. Paelae watched as a group of young boys tossed a ball back and forth to each other, running down a deserted street to throw it in a trash can. They used to play a similar game on the cityship as trainees. It was one of the few bits and pieces they had smuggled from the Earthen culture, played in secret when the officers had left. Once, General Amir had caught them midgame when he came to get Paelae for sparring lessons. Anything Earthen was not to be spoken of or remembered in any way, but she had been rebellious as all teenagers were those days. Everyone had frozen in place. The terror coursing through their bodies made them forget to even salute. Trying to run would have been devastating. Amir had walked between them, assessing the trainees. He had been furious, but his anger hadn’t been displayed in shouting or beating; it had filled the silence that spread between moments in time. “Madison!” This time the words were forceful, bringing her back from the past. Lemise and Benni had already departed from the vehicle and waited for her. With a sigh, she shook the memory away, letting it dissipate into the morning air and jumped out of the jeep. Lemise led them through an open garage door. Inside, the warehouse resembled a miniature junkyard. As Paelae looked closer, she could tell that the piles had been organized to some degree. One had wire, another had chips, and a third was weaponry. “Demitri!” Lemise called. A clatter of metal followed, and the sky captain took that as a cue. They wove in and out of large piles and then climbed over smaller ones until the ground could be seen again. A giant square of cleared floor sat under an open roof, and near the opposite end, a young woman drew up schematics on a metalwork table. “Demitri,” Lemise called again as they walked up to her. Demitri glanced up through layers of grease stains and smudges of dirt. Bright red hair fell in a tangled mess past her shoulders, held back by a set of goggles. Deep, blue crescents were visible beneath her eyes, as if the woman had been bruised. “Did you sleep here last night?” He didn’t address her as a soldier, nor did she wear a uniform. Instead, brown overalls adorned her skeletal frame, and a belt of odd tools kept it hanging up. “You were supposed to be in an hour ago,” Lemise said as the military eased back into his speech. Demitri was about to throw in another bargain when a little girl ran out from behind a pile of piping. She held up a colored picture with evident pride, tugging on Demitri’s pants and grunting to get her attention. Lemise knelt down to the girl’s level. “Hello, Demi.” He smiled. Demi held up her picture of colorful stick figures, grunting as she pointed in stunted movements at each one. Paelae watched in mild horror. Demi was broken. On the cityship, they considered it a mercy to chloroform such children at birth, if they made it that far without detection; and it shocked her that all those years she never thought twice about it. Never before had she encountered one on other planets, though she’d heard stories. “Yeah, she’s better with it now.” Demitri cracked her knuckles in anticipation. “A week and a half, no sleep, and lunches,” he offered. “I’ll leave you to it then,” Lemise said and left, disappearing behind piles of trash. Demitri pulled a chair up for her daughter to continue drawing, and then lounged back in one of her own. “You named her after yourself,” Paelae stated when the silence had extended beyond comfort. “Of course I did. She’s a Devonian.” Demitri fiddled with the lenses on her goggles. Hope Christine was born in Arizona and raised in Colorado. Her youth was spent in Narnia and her teenage years in Middle-Earth. Like most, she grew up with reluctance and then attended college for multiple degrees before settling on Linguistics. Today she studies Middle-Eastern languages and works in retail. She’s opinionated, blunt, loves to bike, and bares an extreme hate of peaches.